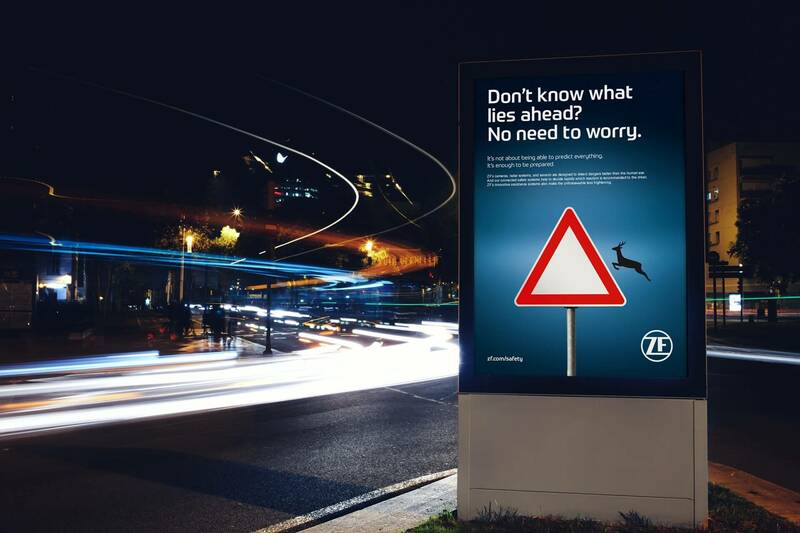 The goal of the new ZF brand campaign was clearly defined. 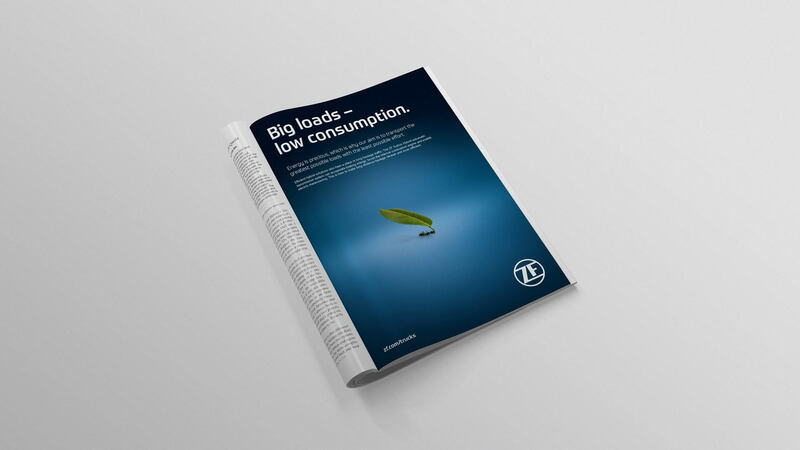 It was to portray ZF, which had recently emerged as the world’s third largest automotive supplier following the takeover of TRW, as one company – a supplier of integrated systems with a broad product portfolio. 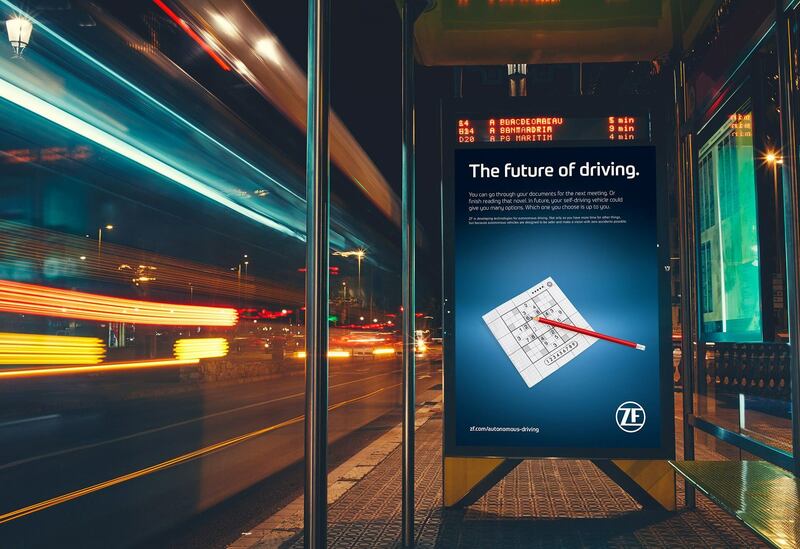 After all, ZF has at its fingertips all the key technologies required to address a major future trend in the automotive industry, namely autonomous driving. 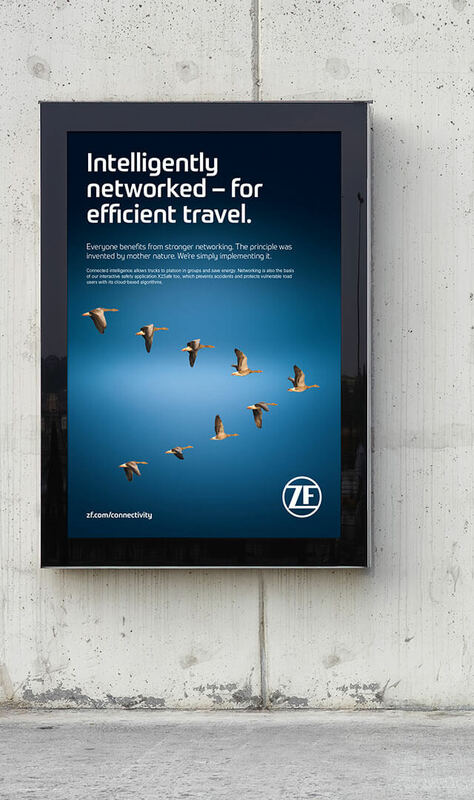 OSK devised the new campaign for the IAA 2017, where ZF also adopted a completely new corporate design for the first time. Under the banner heading “On the road to Vision Zero”, the principal themes were to be occupant safety, low emissions and autonomous driving. 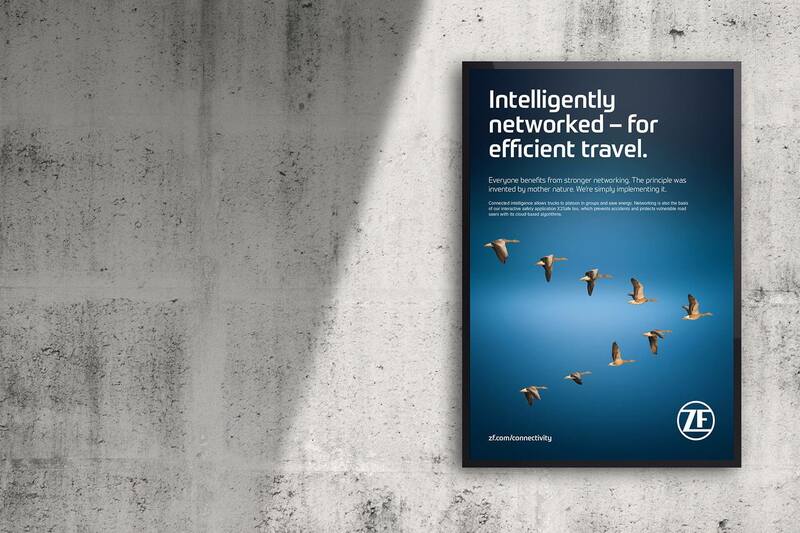 Before the final choice was made, the OSK creative team developed a variety of campaign outlines – from highly technical approaches, as typically favored by automotive suppliers, to radical ideas that stepped beyond the sector’s conventional boundaries. It was the campaign draft with the image of a dead housefly that ultimately prevailed. This main sole motif added the tongue-in-cheek subline “Well, almost” to the “zero accidents” claim that is a component of the overriding Vision Zero message. 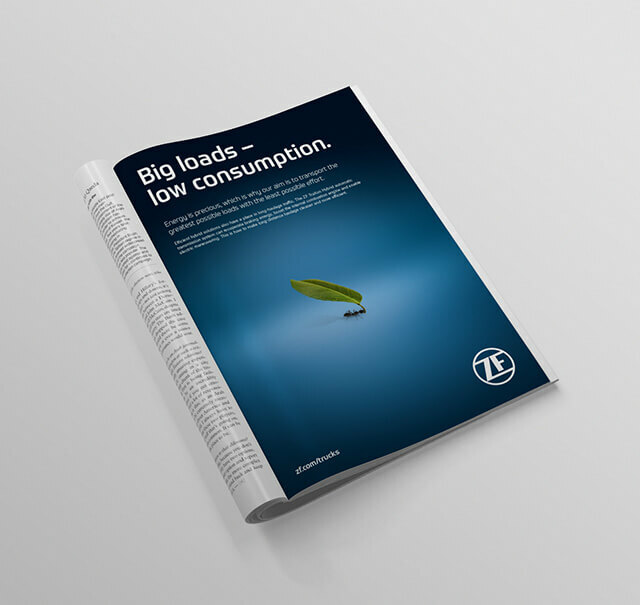 The minimalist visual strategy of depicting automotive trends with pictures that initially appeared completely unrelated to the subject matter was immediately well received by ZF. 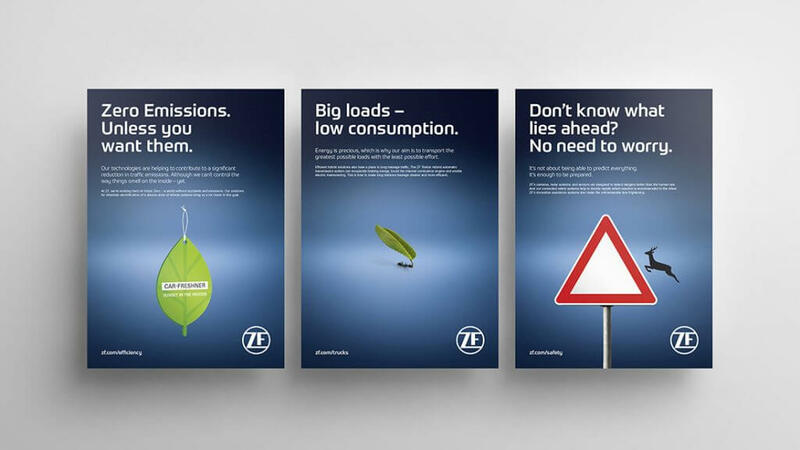 The mechanics of resolving the apparent contradiction in the subheadline and allowing the copy to bear witness to ZF’s competences in the relevant field were systematically expanded in the campaign development phase. 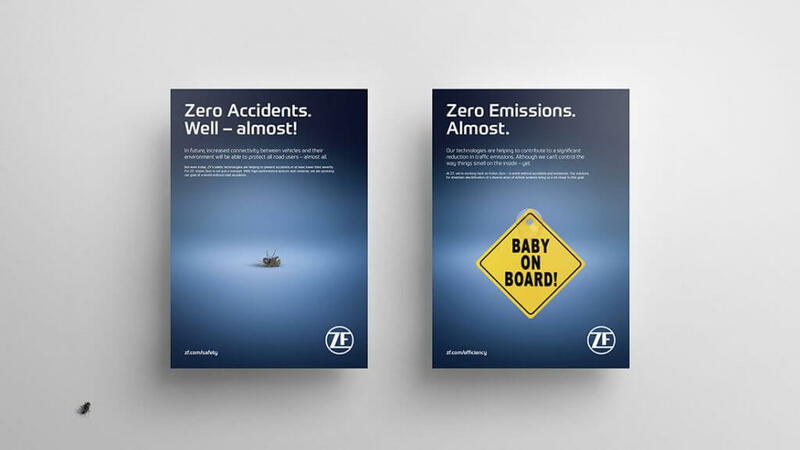 The humorous images selected to illustrate the zero-emission and odor-free attributes of electric cars – on the outside at least – include a “Baby on board” sticker and a tree-shaped air freshener. And a sudoku puzzle book under the headline “The future of motoring” illustrates one of the pastimes that drivers will be able to enjoy while cruising in an autonomous car. The campaign now encompasses no fewer than six topics – demonstrating that even technically complex subjects can be addressed with a sense of fun that captures the public’s attention.